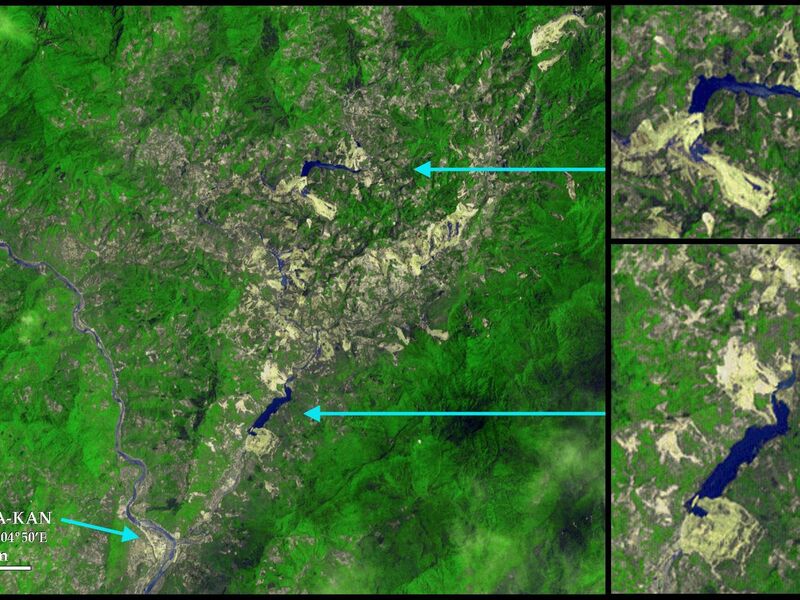 The Sichuan earthquake in China occurred on May 12, 2008, along faults within the mountains, but near and almost parallel the mountain front, northwest of the city of Chengdu. This major quake caused immediate and severe damage to many villages and cities in the area. Aftershocks pose a continuing danger, but another continuing hazard is the widespread occurrence of landslides that have formed new natural dams and consequently new lakes. These lakes are submerging roads and flooding previously developed lands. But an even greater concern is the possible rapid release of water as the lakes eventually overflow the new dams. The dams are generally composed of disintegrated rock debris that may easily erode, leading to greater release of water, which may then cause faster erosion and an even greater release of water. This possible "positive feedback" between increasing erosion and increasing water release could result in catastrophic debris flows and/or flooding. The danger is well known to the Chinese earthquake response teams, which have been building spillways over some of the new natural dams. 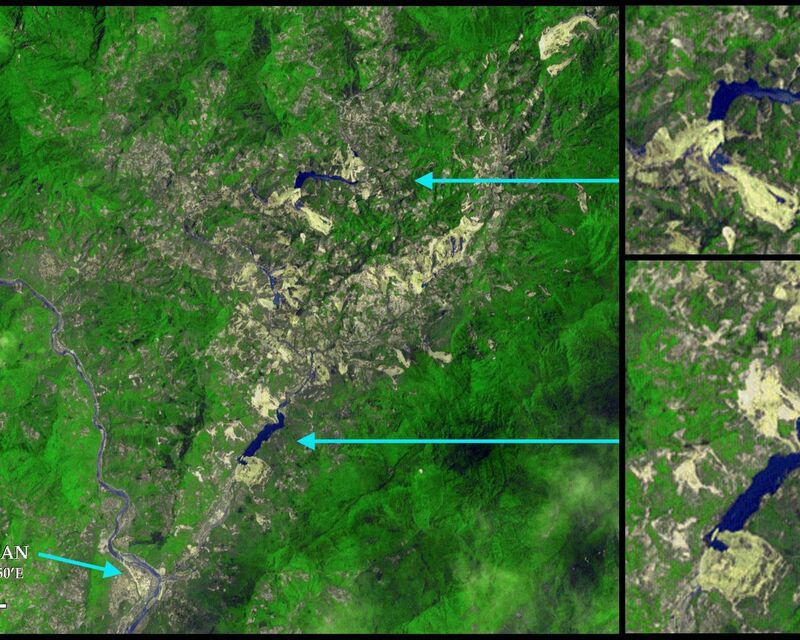 This ASTER image, acquired on June 1, 2008, shows two of the new large landslide dams and lakes upstream from the town of Chi-Kua-Kan at 32Âº12'N latitude and 104Âº50'E longitude. Vegetation is green, water is blue, and soil is grayish brown in this enhanced color view. New landslides appear bright off-white. The northern (top) lake is upstream from the southern lake. 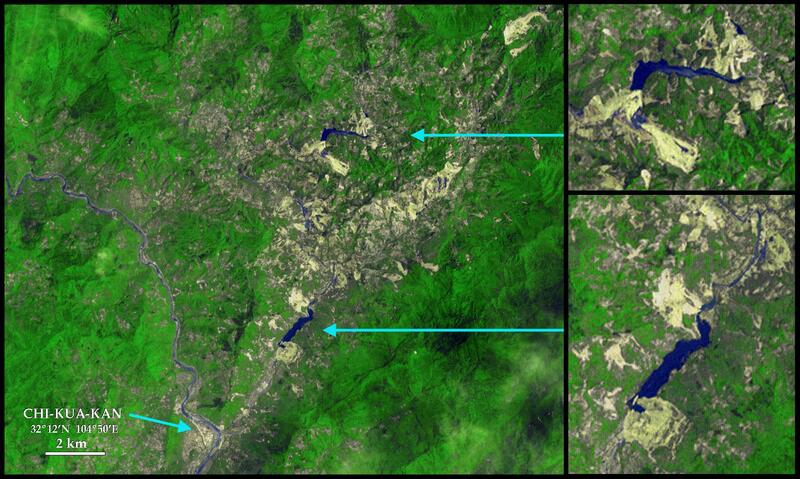 Close inspection shows a series of much smaller lakes in an elongated "S" pattern along the original stream path. Note especially the large landslides that created the dams. 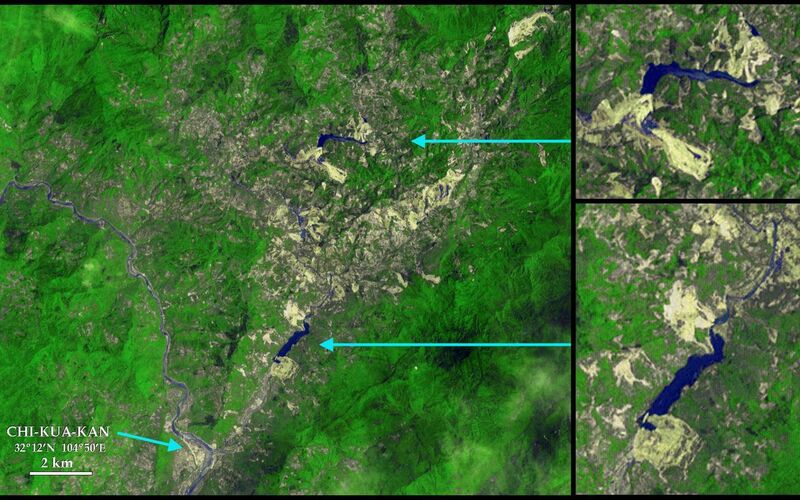 Some other landslides in this area, such as the large one in the northeast corner of the image, occur only on the mountain slopes, so do not block streams, and do not form lakes.